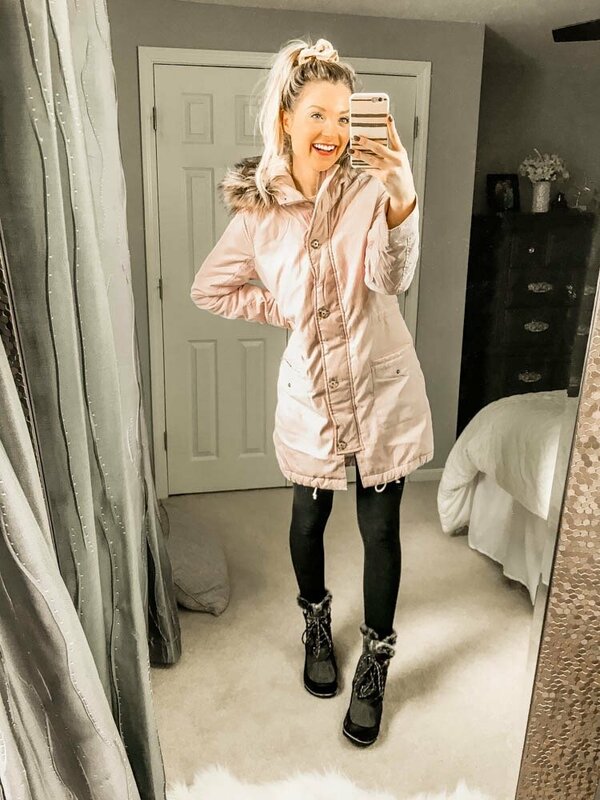 It’s definitely time to look for some good Winter coats here in the Midwest, and I recently ordered this cute and warm parka from Abercrombie! I originally got a cute peacoat from Target, but I just felt like I needed something warmer with a hood. I’m all about being practical right now, so I made sure to find something really warm AND cute to wear this Winter! This pink coat is perfect, and I have been loving it! I ordered the Small, so that I would have plenty of room for sweaters and sweatshirts underneath. I really love the fit! My coat is currently on sale for just $80 (normally $200) + free shipping! It is linked above and below! I will also link some of the other affordable Winter coats that I just found! You can shop my whole outfit above as well! If you are wondering about sizing, my Winter boots (under $50 + free shipping) are true to size with some wiggle room. I got my normal size 8, and there is plenty of room for thicker socks! Don’t worry about them being too loose, because you can tighten the boots when you tie them! 🙂 I recommend sizing up in my leggings (under $10 + free shipping), because I usually size up to a Medium in this specific kind! Shop Winter Coats Under $100 Below! A lot of the Winter coats above are such a great deal right now! A bunch of them are even under $50! So definitely make sure to grab one or more before Christmas while the sales are going on! If you want to shop a bunch more Christmas gift options for her, you can always go to my Christmas Shop tab on my blog as well! This entry was posted in Fashion and tagged affordable coats, coats, Winter coat, Winter coats, Womens coat, Womens coats. ← Old Navy Cozy Gifts for Her Under $50!